Watch their eyes light up as the Cosmic lights turn on! 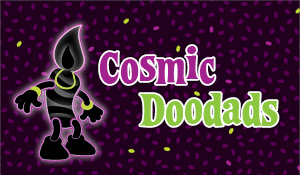 Our Cosmic add-on makes any party one of a kind and leaves a lasting impression on the birthday boy or girl and your guests. 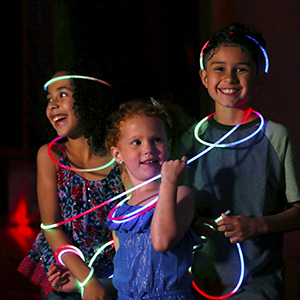 Plus everyone gets a glow necklace to use during the party and then take home for more fun! 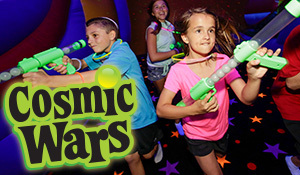 If you are already thinking that your child would love to have a glow in the dark Cosmic party, make it even better by adding Cosmic Wars! This cool experience includes LED light, laser lights and the use of our glow in the dark moon blasters in our SECOND bounce room. Participating guests will be provided an air-powered "Pop Gun" that pumps out harmless, glowing soft plastic balls that travel up to 20 feet! Your party guests--and trust us, adults LOVE to play this, too. You will be able to use our huge inflatables to dodge, hide and aim from to "blast" other players as the balls fly through the air. The glow wars experience is recommended for 6 and up! NOTE: In order to do Cosmic Wars you need to have already added Cosmic Bouncing. 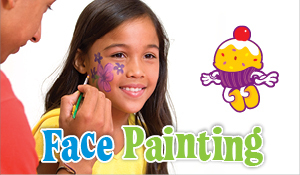 Designs are painted on faces or hands using non-toxic kid friendly paints. Face painting takes place the last 50 minutes in the party room as you and your guests enjoy pizza and cake! *A 2 week notice is needed for a face painting add on. 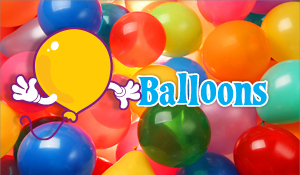 A balloon twisting pro is just the thing to liven up the party. 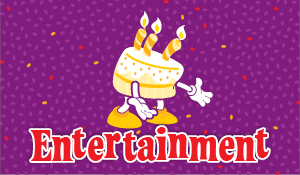 Part entertainment, part souvenir! The artist will join you in the second bounce room and then the party room. Pricing is for one hour. 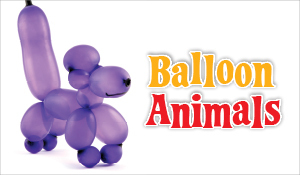 *A 2 week notice is needed for face painting,balloon twisting,& Characters. 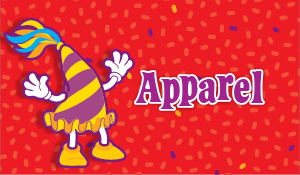 A comical clown amuses party goers with tricks, cool dance moves and games in the second bounce room and party room. 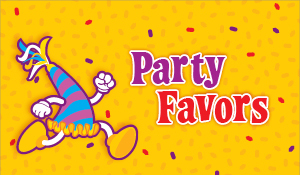 Or invite your child's favorite costume character to party with you at BounceU! 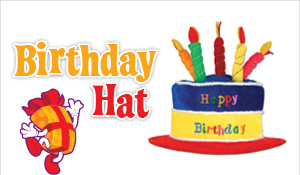 The character will join you in the second bounce room and then come visit in the party room before cake. Pricing is for one hour. PLEASE NOTE: A 2 week notice is needed for booking a clown or character. 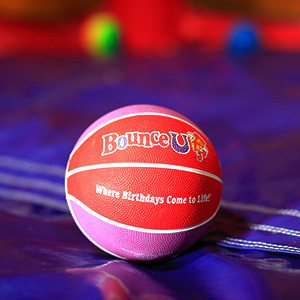 Let our dedicated party staff get all the GREAT action shots of your group while bouncing and having a great time during your party! 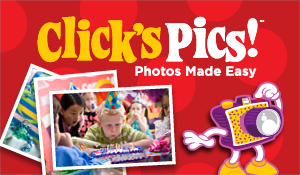 We will load these pictures to the TV in your party room so you and all the guests can preview these great pictures! 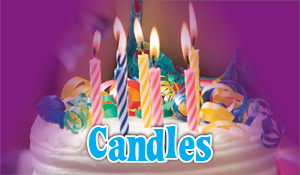 Let your party staff know if you would like to add these to your party package! 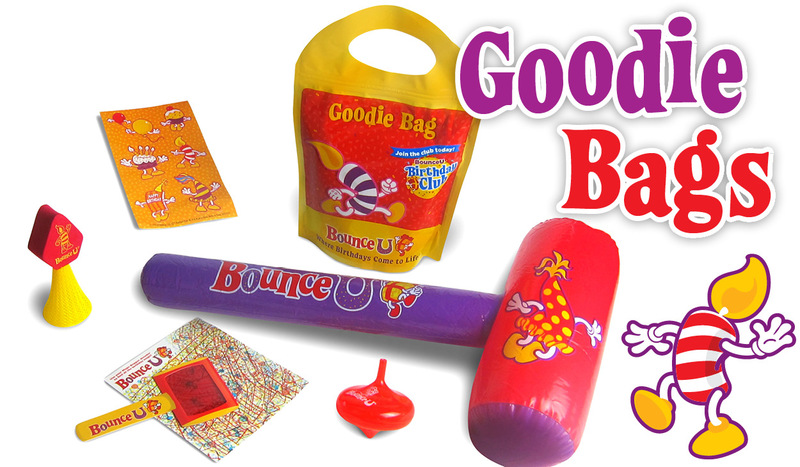 Our BounceU Goodie bag is easy and full of fun toys, including a mini BounceU Bopper, birthday jumper, hand tattoos, a spin top & a buy one/get one bounce pass! 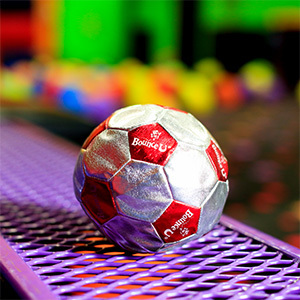 The BounceU Mini Soccer Ball has lots of bounce! Practice your footwork, or toss it around with your friends and kick off the fun! A 10 day notice is needed for ordering. Kids will have hours of fun playing with this 7" basketball featuring our whimsical birthday characters. A week notice is needed to add these to your party. 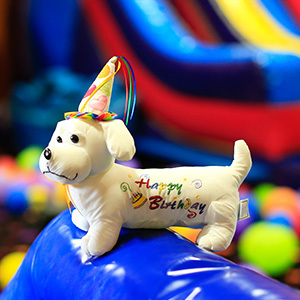 Our cute "autographable" BounceU stuffed dog is a perfect way for your birthday child to remember their special day! 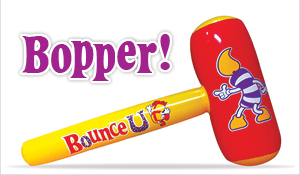 You don’t need a special occasion to bounce! 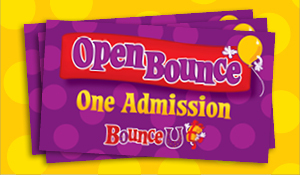 Instead of a goodie bag, give your guests an Open Bounce Pass, and they can bounce back for fun and good times.